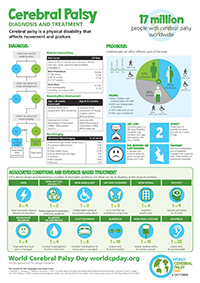 World CP Day, on Saturday 6 October 2018, is a perfect time to celebrate and learn more about cerebral palsy - the most common physical disability in childhood. Acceptance of diversity and empathy for people living with a disability is one of the most important building blocks for tolerance and inclusion. It is time to close the gap between the everyday circumstance and the very real potential of those living with CP. 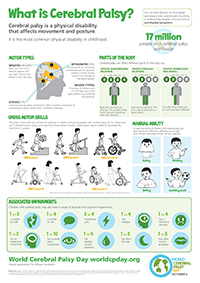 To show our support, the Euro-Peds Foundation is sharing these resources originally created and organized by the World Cerebral Palsy Day non-profit. 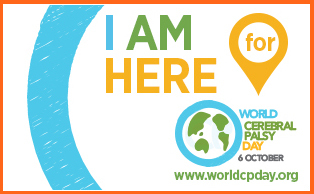 To learn more, visit worldcpday.org, sign up for News or, even better, Join Us on the Map! The Making it Real – video series showcases the personal experiences of people with CP talking about issues that affect us all such as building confidence, achieving goals, everyday challenges, personal hopes, bullying and relationships. Charisse, Living with Cerebral Palsy is a YouTube channel hosted by Charisse Hogan, who creates videos to raise awareness life with CP. A Day in the Life is a series of 3 videos where Charisse demonstrates the impact of her CP on everyday tasks. This book explores the questions that children with cerebral palsy have about being different, and has been an Australian favourite for many years. Our thanks to the publishers, Ability Centre, for making this available as a PDF to download for free. A heartwarming tale of a little girl who forms a close bond with a friend who has CP. The girl finds that, through her art, she can reach her special friend Suhana. This delightful book explores questions and concerns about physical disabilities in a simple and reassuring way. 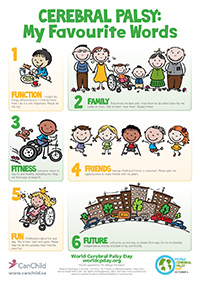 Younger children can find out about individual disabilities, equipment that is available to help children with a disability, and how people with disabilities can live happy and full lives. Gerald the giraffe longs to dance, but his legs are too skinny and his neck is too long. At the Jungle Dance, the warthogs waltz, the chimps cha-cha, and the lions tango. “Giraffes can’t dance,” they all jeer when it’s Gerald’s turn to prance. But with some sound advice from a wise cricket, Gerald starts swaying to his own sweet tune. A boy in a wheelchair and his best friend pretend they’re pirates on a ship, mountain climbers, astronauts, explorers and Olympic sprinters. But even when they’re not playing make-believe, they have a great time together doing everyday things – swimming and basketball – because they’re best friends. Oshie is an engaging, funny, enthusiastic and often rebellious boy – it just so happens he has cerebral palsy. In these four stories, Oshie wins the admiration and hearts of his classmates for the abilities which compensate for, and partially arise, out of his disability. Jams Cogan, a boy with CP, and the lovable anarchic monkey who comes to live with him. Jams and his mum love Thimble, but Dad is determined to get rid of him – to a zoo, a school, even a demolition site. But when Jams and his Dad are in mortal danger, Thimble proves once and for all why he is a Monkey Superstar! Romeo was born with cerebral palsy. His CP affects his speech and mobility. It does not, however, affect his ability to solve mysteries! He stays on the go in power wheel chair, and speaks with an electronic communication device. But there are no limits to the trouble he gets into. With a bully after him and a sixth grade teacher who can’t understand his speech, school was hard for a kid with cerebral palsy like Eddie. Eddie needs to find a gift for his little sister’s sixth birthday. In the Treasure Shop, Eddie and his friend Gary discovered a great gift – a blue winged dragon. Sophie invites readers to learn about CP from her perspective – what it is like to use a wheelchair to move around, and use assistive technology to communicate. She introduces readers to some of her friends who have different forms of CP and explains that living with CP can sometimes be difficult, but there are many ways she is supported so that she can lead a full and happy life. 11 year old Melody is the smartest kid in the school but no one knows it. Melody has cerebral palsy, is unable to speak, and most of her teachers and doctors don’t think she is capable of learning. Melody is determined and finds a way to overcome some of the physical and social barriers that are put in her way. Two years on the NY Times best seller list.